I have three children, ages 6-8, so I am always looking for inexpensive costume ideas. This year, we decided a theme that enabled us to build on things we already owned would be the best way to go. We received a costume catalog in the mail, and my youngest daughter said “Mommy, I want to be a poodle skirt girl!” So, after talking it over, we chose to dress in Homemade 50’s Sock Hop Costumes! I looked at costumes online, in stores, and in catalogs. After seeing that each costume would cost at least $20, I decided that it couldn’t be too hard to make one myself. I made the poodle skirts from felt, which I found on sale at a local fabric store. The total cost for both skirts was only $9! I cut a circle pattern out, sewed an easy hem, and added elastic to the waist band. The poodles were iron-on patches, so no sewing was involved. I cut letters out of the leftover felt and pinned them on their shirts, similar to what was worn on ‘Laverne & Shirley’. I thought it made a nice finishing touch! The scarves were borrowed from a friend. It was an incredibly easy costume, and I believe that it could be done without sewing as well. 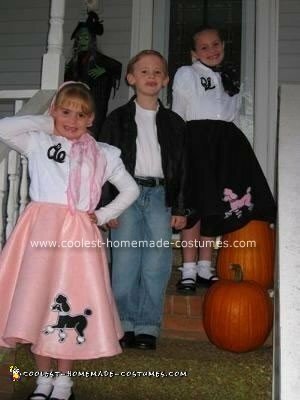 My girls talked my son into being a ‘greaser’, which was great. We already had everything we needed for that costume, so there was no cost involved. It turned out so cute, and they have gotten so many compliments. This will be hard to beat next year!